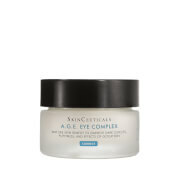 This luxurious cream offers ultimate anti-aging action for instantly transformed eyes. Perfectly hydrated, the skin is smoother and firmer. 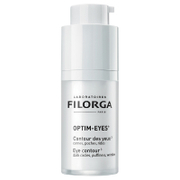 Dark circles and puffiness fade away and the eye area is brightened with renewed youth. Perfect for the lip contour area as well. Lifts and firms the eye area. Put a small amount of the eye cream on the tip of your finger, and then delicately apply with a gentle tapping motion working around the eye from the inside out. Then, lightly smooth the area, beginning with the under eye, then moving out towards the temples and up to the eyelid (repeat 3 times). Aqua (Water), Butylene Glycol, Cetearyl Alcohol*, Ethylhexyl Stearate*, Cyclopentasiloxane, Glycerin*, Triisostearin*, Polymethyl Methacrylate, Bis-Behenyl/Isostearyl/Phytosteryl Dimer Dilinoleyl Dimer Dilinoleate*, Peg-20 Stearate*, Ci 77891 (Titanium Dioxide), Imperata Cylindrica Root Extract*, Ci 77019 (Mica), Hydrogenated Avocado Oil*, Hydrogenated Olive Oil Stearyl Esters*, Silica, Vitis Vinifera (Grape) Seed Oil*, Palmitoyl Grape Seed Extract*, Tocopheryl Acetate*, Hydrolyzed Hibiscus Esculentus Extract*, Dextrin*, Caffeine*, Benzyl Alcohol, Propyl Grapevine Shoot Extract Olivate*, Caprylyl Glycol, Coffea Arabica (Coffee) Seed Extract*, Carbomer, Palmitoyl Grapevine Shoot Extract*, Xanthan Gum, Tocopherol*, Lecithin*, Hyaluronic Acid, Dehydroacetic Acid, Sodium Hydroxide, Polysorbate 20, Sodium Carboxymethyl Betaglucan, Acetyl Tetrapeptide-5, Tin Oxide, Acrylates/C10-30 Alkyl Acrylate Crosspolymer, Palmitoyl Oligopeptide, Palmitoyl Tetrapeptide-7. I got some of this as a sample and liked it enough to try the full-size product. It's expensive, but you need only a very tiny amount to cover the eye area so all in all, I think it's a good value.I don't have issues with dark circles, but this cream does seem to de-puff well when my eyes get puffy and it keeps fine lines at bay. So far, so good! 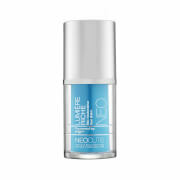 The area around my eyes was developing so many lines, including droopy vertical lines, and this product made a difference overnight. I have continued to use it twice a day for about 3 months, and it really works; the problem area is greatly diminished and the lines are now barely noticeable. I only use a tiny amount of product, patting it on with my ring finger, and that's all it takes. Although it is expensive, I will continue using this product. I recently started using this line and it's my new favorite. The eye cream doesn't seem to be as effective for puffiness as some others, so on puffy mornings I use something else. But for night use, it is very luxurious, hydrating, and smells great. I believe the color of the eye cream will cover some of your dark circles. I personally love Caudalie products and this eye cream is no exception. It goes on smooth and absorbs quickly without leaving any residue or grease. You don't have to use much; just a gentle pump to dispense a tiny amount will do. I am not sure if it has done much for my dark under eye.